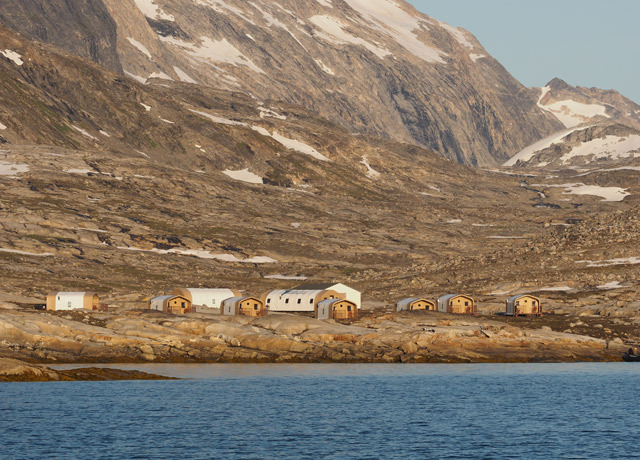 Natural Habitat’s Base Camp Greenland offers an exclusive refuge of comfort in the Arctic, where guests enjoy rustic luxury surrounded by raw wilderness. 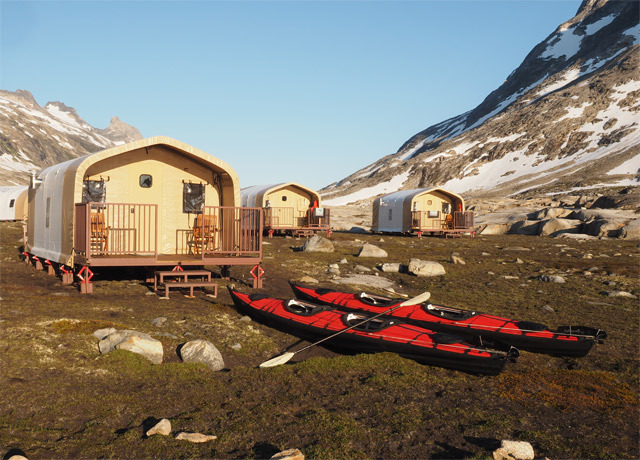 Though it's located in one of the most remote places on the planet, the camp provides a host of amenities usually reserved for far more civilized locales. Guest accommodations are in eight individual safari-style tent cabins that house two persons each. 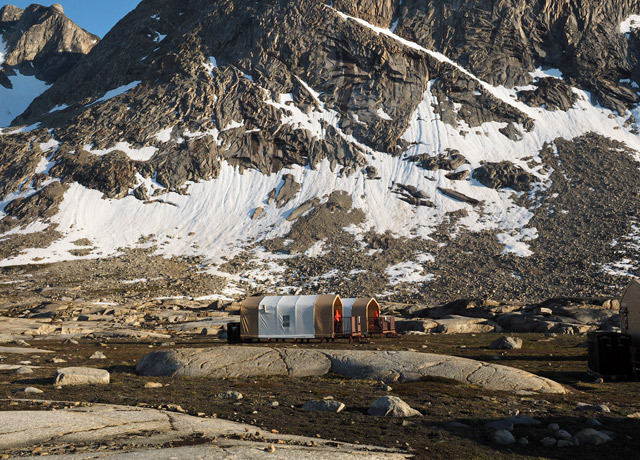 Built of heavy-duty vinyl on raised platforms, each cabin has a private veranda with a view of the bay and Greenland ice sheet in the distance, offering a chance to enjoy a panorama of the wilderness in sublime solitude. Spacious cabin interiors are warmed by an individual heater—welcome on chilly nights—though long summer days here are often quite mild and dry. 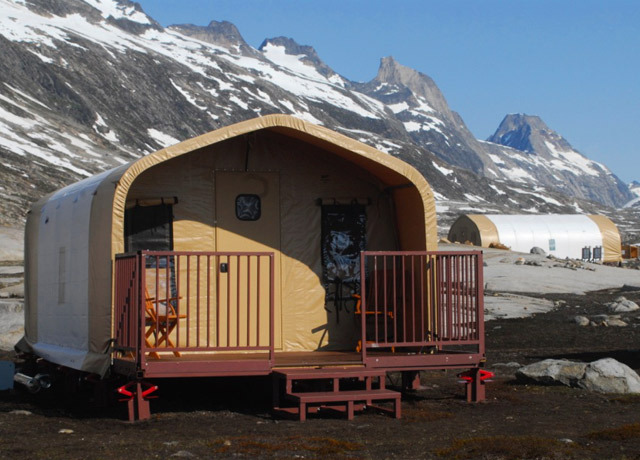 Cozy tent cabins have twin beds outfitted with warm comforters and comfortable pillows, a sitting bench, carpet runner, hanging clothing storage, and an en suite odorless dry toilet and washbasin. Hot showers are available in a separate bathhouse segregated by gender. Guests enjoy social time in the camp's inviting yurt, a comfortable, well-lit indoor space for lecture presentations and lounging, plus a spacious deck from which we can take in the view of the bay. Retreat to the dining tent for excellent meals prepared by our creative camp chef, with fresh and varied ingredients arriving regularly.